A running mate is a person running together with another person on a joint ticket during an election. The term is most often used in reference to the person in the subordinate position (such as the vice presidential candidate running with a presidential candidate) but can also properly be used when referring to both candidates, such as Barack Obama and Joe Biden were running mates in 2008 and 2012. Running mates are typically chosen to balance the ticket geographically, ideologically, or personally, as when the staid New Englander John F. Kennedy was matched with the folksy Texan Lyndon B. Johnson in 1960. Or, in 1984, when male Walter Mondale was paired with female Geraldine Ferraro. The object is to create a more widespread appeal for the ticket. Presidential candidates from smaller states sometimes choose a vice presidential running mate from a state with a large number of electoral votes – as when Walter Mondale of Minnesota (10 votes) selected Geraldine Ferraro of New York (then 36 votes). It is preferred, but not legally required, that the running mate be from a different state from the presidential nominee, because each elector can vote for no more than one candidate from his or her own state. Running mates can also be chosen from swing states in order to boost a candidate’s chance of winning in the state. Some few weeks ago, we saw Think Tanks from different political parties (esp PF and UPND) analysing how small the Western Province vote is when the Electoral Commission of Zambia announced new numbers on the voters Register. The premise was that Western Province would ordinarily give the vote to UPND leader Hakainde Hichilema while Northern Province, if harnessed well, would also give the vote to President Lungu. President Lungu has finally picked his running mate from Western Province. My take is that it was easier for him to pick mama Inonge than have the headache of picking any other person. He may also have picked Mama Inonge to balance up or gain the votes he can from Western Province where Government has done a multi million dollar Mongu – Kalabo road. If President Lungu manages to get the Western vote or at least increase his numbers by 20 percent as compared to the last one without dwindling the Northern and Muchinga vote, then he is somehow safe. Now all eyes are on HH. 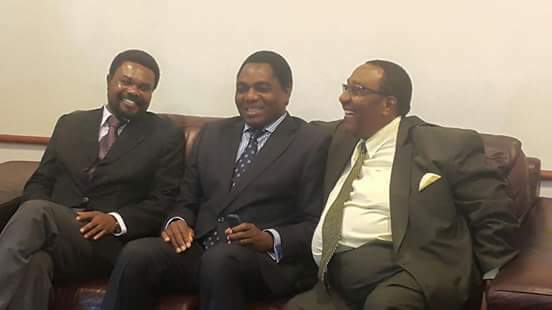 Realistically, HH is expected to pick his running mate from northern side of our country as we already have candidate from East (Edgar Lungu), West (Inonge Wina), South (Hakainde Hichilema) and now remaining with North. If HH manages to pick a Northern running mate and increases his vote in Northern Province, Copperbelt and Lusaka by at least 15 to 20 percent, he will give a very tough battle to EL and be very safe too. Will NDC fire their Consultant for losing all by-elections? My take on inonge as running mate for chagwa, this will put doubts in a lot of people about her, because her stance on the barotse issue is not clear, and as running mate this automatically puts her in contention for presidency should the unspeakable happen, and we all know how powerful a president can be in this country,will lozis vote for her in hope that their dreams of a barotse can be realized? Edgar Lungu Breaks Bemba Hegemony. Finally his excellency, President Edgar Chagwa Lungu under the guidance of former president Rupiah Banda has finally broken the back of the Bemba hegemony by dribbling all “Bemba” Veep hopefuls in Felix Mutati, Edith Nawakwi, Nevers Mumba, Chishimba Kambwili, Harry Kalaba, Nkandu Luo and one Kapwepwe at the IMF headquarters and settling for Inonge Wina from Western province. It is widely believed in Zambia that Bemba’s are king makers and one cannot afford to snub them politically and succeed. With the foolproof system that EL has put in place, thanks to Israelis, that will ensure that PF emerges winner after the August election and the elections to come in the future, it seems feasible that the PF will rule for 100 years to come with the early decades without a Bemba in position 1 or 2 and therefore EL doesn’t need to appease these king makers henceforth. This is likely to happen as Inonge Wina will have to show appreciation for her selection, should EL not stand again, by selecting an Easterner as his running mate in 2021. The main reason for this is to defuse the culture of corruption and tribalism institutionalized by Bemba leaders in the past, specifically former and late president Michael Sata, by keepingatway the Veep position, from Bemba leaders. Despite Inonge Wina having weak support currently in western province, her appeal will soar as EL is promising to restore the BA64, if western province votes for him overwhelmingly. The Litunga has already been handsomely bribed to steer this program and deliver western province to EL. It is yet to be seen if this time the PF will honor their promise as former and late president Michael Sata did not deliver after winning the election. By Jacob Cleverboy Nyirenda, Chipata. So Edagar’s choice of ‘mama Wina’ means that should the unspeakable happen again, ba madam automatically assumes the Presidency right? Chisuma! Fili eko tuleya. @jealous down:WHETHER YOU WERE THERE OR NOT MATTERS LESS TO US MAJORITY PF LOVERS AND THE WIND OF CHANGE WHICH YOU TALK ABOUT IN UPND IS ONLY IN YOUR TONGA LAND.MAJORITY OF US NONE TONGA WILL VOTE FOR PF AND THERE IS NO WIND OF CHANGE IN OUR AREAS! !plus whether you like it or not,PF will sweep Lusaka and Copperbelt urban seats like it did in 2011!! !DONT FORGET THAT EVEN THOSE PF MPS OR SENIOR LEADERS WHO HAD DOUBTS ABOUT PF’S POPULARITY AND WANTED TO CROSS OVER-COULD HAVE CHANGED THEIR MINDS TODAY AFTER SEEING SUCH MAGNITUDES OF PF LOVERS! !SO TODAY’S RALLY HAS GIVEN PF MORE STRENGTH AND UPND AS USUAL IS A BIG LOSER HERE!! !even voters who maybe were worried today proved beyond any doubts that PF is still Mighty!! !”UMUNTU NI LUNGU-2016!!SONTA!!! You deluded with shipped crowds from across the country. If wishes were horse sir,,,,,,,. Just be ready for what is coming your way in August. Very good analysis. All the four corners of this should be be represented in these elections. East Chagwa, West Inonge, South HH, North ????????? but certainly from North. This is a foregone conclusion as to the winners. It is for all of you bloggers to make your own conclusions. All the best to UPND.